Find hotel near Ruamm Spa- Urban Spa Retr .. It would be unfair besides being unreasonable to be in Thailand and not get yourself a rejuvenating spa therapy! This is a place ideal to on a lazy afternoon with a bunch of friends. It’s setting does not provide the utmost privacy, but the blissful therapies make up for this one drawback. The therapies are designed in such a way that along with your body even your spirit and mind are rejuvenated. A heavenly aroma will welcome you, the moment you step in! 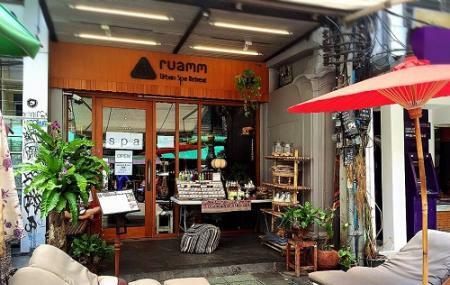 How popular is Ruamm Spa- Urban Spa Retreat Khaosan? People normally club together National Science Centre For Education and Erawan National Park while planning their visit to Ruamm Spa- Urban Spa Retreat Khaosan. The one hour head, shoulder and neck treatment was great. The indoor ambience is relaxing- no need to be sitting on Khao San road getting massaged! We went back for a foot massage. It was great but later in the evening so the outdoor noise and music ruined the experience. The staff seemed tired that late as well. The place was really clean! the survive and massage were great! If you need a massage. You should go there. I have been back three years in a row and found the massages excellent value. This time had three foot massages in a row over three days and and the masseur was very good, using just the right amount of pressure for me to feel benefit, not pain. It was important as I have had a bad ankle injury for sometime and he recognised that and made my ankle feel much better. For the price it was excellent value. Just wish I had the opportunity for such a quality massage for such a cheap price back in Australia!! I really very enjoyed the body massage today as I was looking for more strong massage, and the lady did super good job. If I come Bkk next time, I would happy to come here again and I wish the lady will be in this shop too. Bad quality massage.. i saw the reviews at 4.2 and thought it was good so i tried it. I wouldn’t give it more than a 2. Leaking A/C in the room, i asked for Thai massage, i was given half of the stretches and movements of a session.